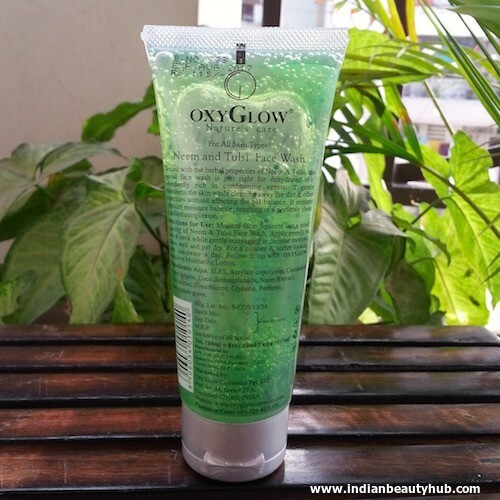 Hello readers, my today’s review is about the Oxyglow Neem & Tulsi Face Wash. I have a combination oily skin which is prone to acne and blemishes. Skin care products with neem & tea tree extracts work great for my skin, that why I bought it. I ordered this face wash along with some more OxyGlow skin care products, online from Oxyglowcosmetics.com. Packaging : The face wash comes in a semi-transparent plastic tube with grey flip cap. The packaging is sturdy, convenient to use and travel friendly. All the required product information like its claims, usage, ingredients and expiry date, is given on the tube. This gel based face wash comes in a light green color and contains small green mini-capsules which dissolve while massaging. It has a refreshing neem & tulsi mix fragrance which is not very strong. I take a generous amount of this face wash and massage it gently all over my damp face and neck. It produces medium lather and cleanses the skin very well. It removes all skin impurities, oil and mild makeup quite effectively and leaves the skin clean and refreshed. 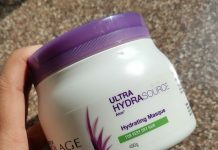 It is very moisturizing and my skin doesn’t feel dry or stretchy after its usage. 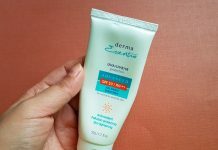 I have been using it for past two weeks and it didn’t cause me any skin breakout. Its hydrating properties make it an ideal face wash for normal and dry skin people. Whereas people with oily skin can use it only during the winters. 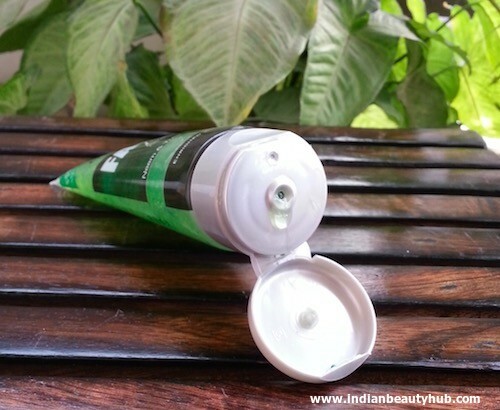 This face wash is enriched with some interesting natural ingredients like neem, tusli, etc. The quantity provided for its price is pretty good and this 110ml tube will easily last for 2-3 months. 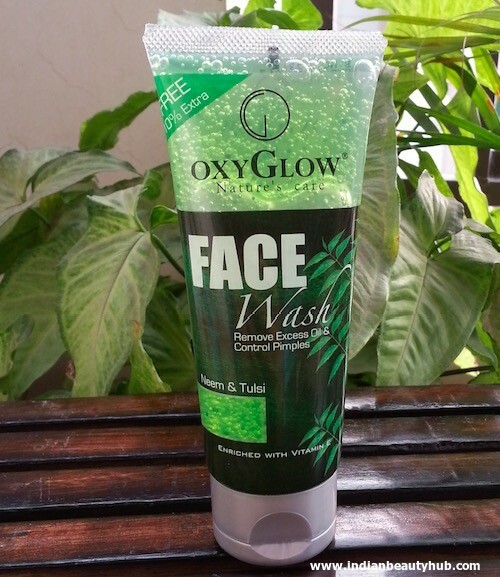 Oxyglow Neem & Tulsi face wash is ideal for both men and women. It is not very expensive and is easily available at online shopping websites. 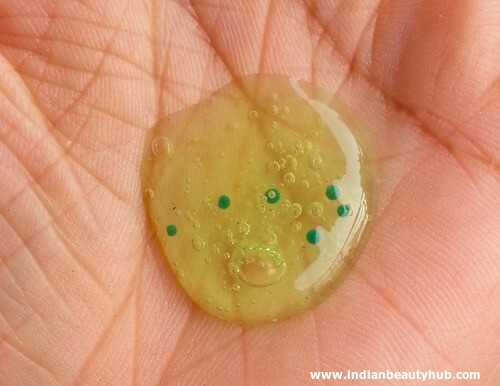 The face wash has a runny consistency which sometimes leads to the product wastage. It doesn’t make my skin squeaky clean and leaves a slippery feeling on the skin. Not suitable for oily skin people. Not very effective in controlling sebum production and preventing pimples. I have acne prone oily skin and I haven’t seen any reduction in pimples and spots. I think the full ingredients list is missing. Claims : Blessed with the herbal properties of Neem & Tulsi, this special face wash is just right for dehydrated skin. Abundantly rich in conditioning agents, it gently smoothens the skin while cleaning away the dirt and other impurities without affecting the ph balance. It restores optimum moisture balance, resulting in perfectly clean and radiant skin. 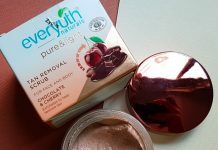 Ingredients : Aqua, SLES, Acrylate copolymer, Cocoamido propyl betaine, Coco diethanolamide, Neem Extract, Tulsi extract, Dimethicone, Glycerin, Perfume, Minicapsule green. 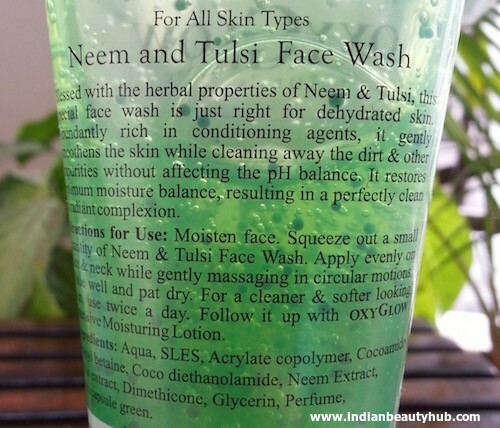 All in all Oxyglow Neem & Tulsi is a pretty decent face wash. It cleanses the skin well and leaves skin clean and hydrated. I recommend this face wash for people with normal and dry skin, because of its moisturizing properties. Oily skin people should skip this one as it doesn't give squeaky clean skin.